Habaki : Silver and gold single color habaki. 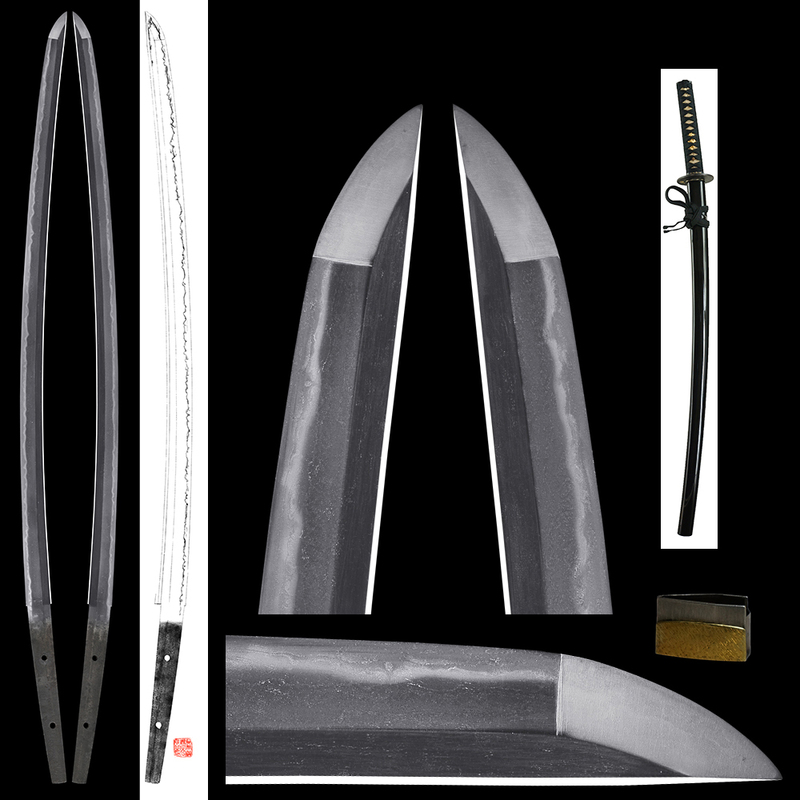 Blade length : 67.27 cm or 26.48 inches. Sori : 1.65 cm or 0.64 inches. Width at the Kissaki : 1.99 cm or 0.78 inches. Kasane : 0.60 cm or 0.23 inches. 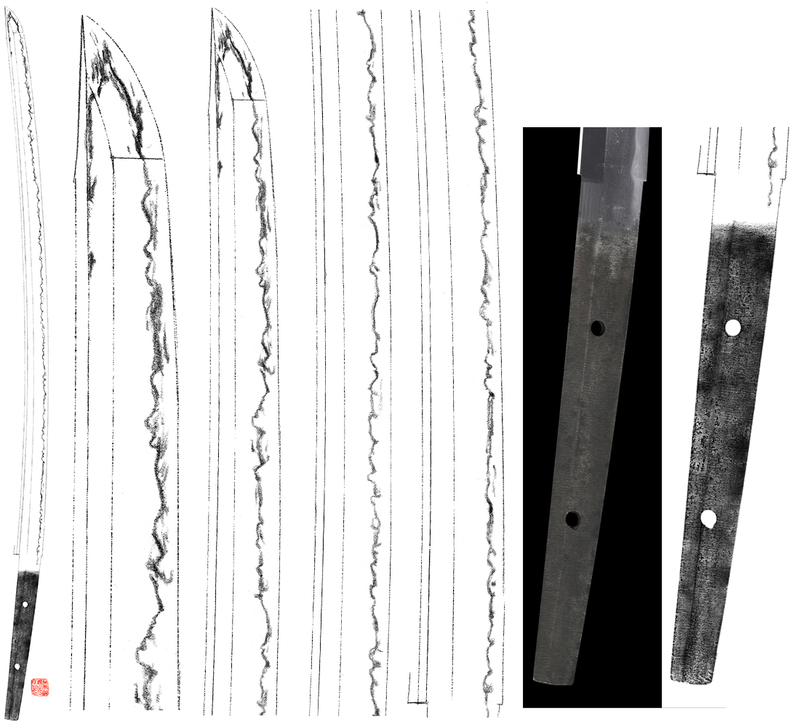 Shape : The blade is oosuriage mumie(cut shortened) and regular size with deep sori nice looking shape. Jitetsu : Itame had and mokume had mixed with jinie attach and right shirake Utsuri appear. Hamon : Koniedeki gunome midair and togari gunome midair mixed with small sunagashi and kinsuji work. Special feature : From the Jigane and Hamon, the blade looks Mino Senjyuin. This school started from Nanbokucyo period to late Muromachi period. So many years ago, sword makers in Nara, moved to Mino province and made swords mixed up with Mino school and Senjyuin style. So the blade remind Senjyuin flavor and much better than Mino school. The blade is pretty nice condition without Kizu and flow. Tsuba : Round shape iron Tsuba. Fuchi : On the syakudo nanako plate, an arrow is engraved with gold color. Saya : Black roar saya. Menuki : A dragon is engraved with gold color. Modern times.